Yankees great insists he's a long way from curtain calls on the links. This past July 4th, Yankees great Derek Jeter hosted a barbecue at his house. Pretty standard stuff for most of us, but in the case of Jeter, who know oversees the website The Players’ Tribune and a couple of Simon & Schuster imprints, it was a big deal. “First time ever,” he told THR reporter Marisa Guthrie, who interviewed Jeter (with help from colleague Scott Feinberg) for the cover of this week’s sports issue. Jeter now lives full-time in Tampa, where he recently has taken up golf; former teammates Tino Martinez and Gary Sheffield are frequent golfing partners. “I’m very bad,” he says unconvincingly. Ha ha. We don’t blame Guthrie for being a little skeptical. 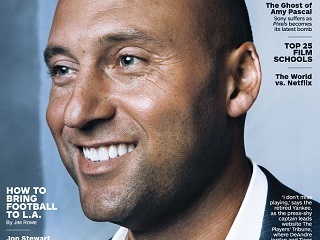 Meanwhile, Players’ Tribune president Jaymee Messler tells THR she has given up on trying to get Jeter to join Twitter. She has also been pitching, so far unsuccessfully, the idea of #2 doing a bit of grassroots promotion for the Tribune by showing up, unannounced, at a Central Park softball field to surprise the corporate teams on the field.